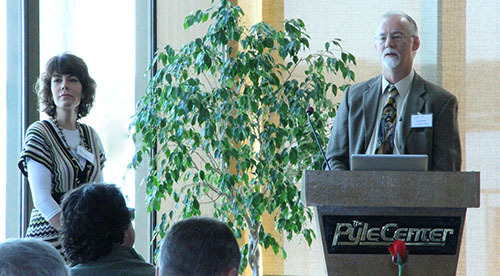 John Frey, MD, delivered the opening plenary sessions at the RTT Collaborative Annual Meeting. 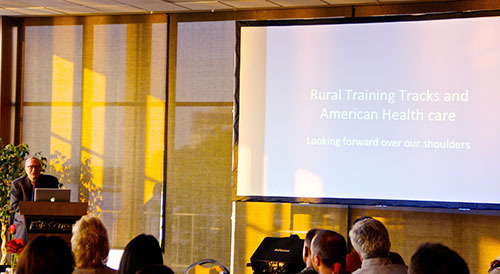 Department of Family Medicine and Community Health (DFMCH) faculty and graduates were among the speakers at the Rural Training Track (RTT) Collaborative Annual Meeting, held May 27-29, 2015, at the University of Wisconsin-Madison’s Pyle Center. 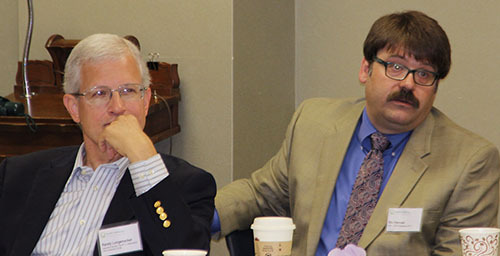 The event bought together rural graduate medical education (GME) advocates and educators, content experts, policy leaders and family medicine program directors from around the nation. The main draw: to develop real-world solutions for the critical shortage of rural physicians throughout the United States. 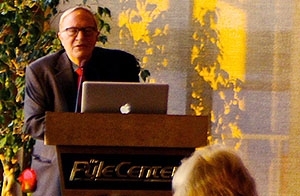 John Frey, MD, professor emeritus and former chair of the Department of Family Medicine and Community Health (DFMCH) was the event’s opening plenary speaker. John Frey, MD, gave the opening plenary session. Dr. Frey proposed that a primary step to advancing rural health care might be about employing “the right people.” He added that new infrastructure, technology and curriculum might help, such as initiating a rural massive open online course (MOOC). During the first session of the RTT Technical Assistance Program, participants raised vital questions regarding federal regulations of GME finance and their application to rural programs. Guest speaker Miechal Lefkowitz, who represents the Centers for Medicare and Medicaid Services (CMS) as Regional Office Rural Health Coordinator, explained that CMS is a regulatory agency and is not involved in developing or recommending workforce policy. The DFMCH’s Lou Sanner, MD, MPH, joined in the discussion. CMS representative Miechal Lefkowitz and the DFMCH’s Lou Sanner, MD, MPH, spoke about how GME regulations affect rural programs. Later in the event, John Brill, MD, shared the independent academic health care system’s perspective on developing an RTT; and Byron Crouse MD, presented rural workforce initiatives at the University of Wisconsin School of Medicine and Public Health (SMPH). RTT Collaborative Executive Director Randall Longecker, MD, and the DFMCH’s Baraboo RTT Director Stuart Hannah, MD. 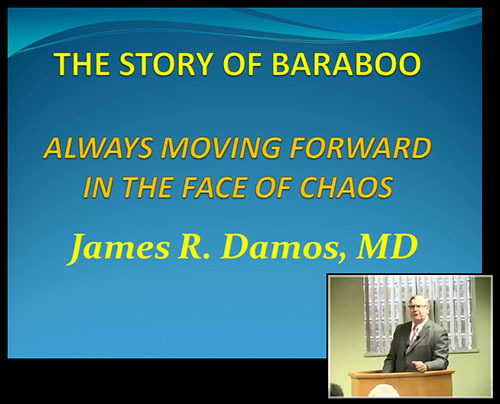 The event concluded with a day visit to Baraboo, Wisconsin, where participants toured St. Clare Hospital and enjoyed “The Story of Baraboo,” a talk by Baraboo RTT founder and former director James Damos, MD. Later, Baraboo graduate Jill Kruse, DO, gave a presentation on the Avera LIGHT Program, a systems-based approach for preventing physician burnout. Finally, a panel of Baraboo RTT graduates spoke about why they chose the program and the factors that make a successful RTT. Forward movement, they said, is inspired by teamwork and values. The RTT Collaborative is a board-directed cooperative whose purpose is to sustain health profession education in rural places through mutual encouragement, peer learning, practice improvement, and the delivery of technical expertise in support of a quality rural practice.